Enter Our Facebook Photo Contest for a Chance to Win! Banners.com and Shirtspot.com have teamed up together to give away free stuff! All you have to do is enter our Facebook photo contest! Enter the Facebook Photo Contest for a Chance to Win! Just for entering we are giving you $15 off your next order of $100 or more at Banners.com! 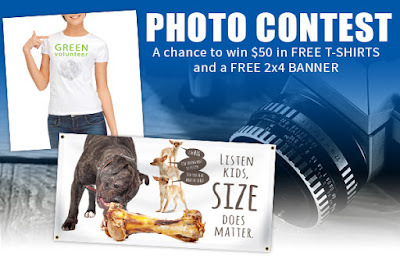 The person / company with the most points will receive a free 2' x 4' vinyl banner from Banners.com and $50 in free t-shirts from Shirtspot.com! Hurry, the photo contest ends on April 22, 2016. Visit our Facebook photo contest tab to enter.